Any of you heard about this development between Delaware and Lewis Center? ^ I was going to start up a new thread for this Evans Farm development, but saw that you had posted about it in the Delaware County thread. So we'll just let you be this thread's opening post. - 1,000 acres of farmland (550 acres in Orange Township and 450 acres in Berlin Township) would be developed into a walkable community with a mixture of residential and commercial uses using New Urbanist design principles. - They are beginning with the 550 acres in Orange Township just east of Olentangy High School between Lewis Center Road and the township's northern border and eventually plan to develop about 450 acres farther north in Berlin Township, near the City of Delaware's southern border. According to the above linked article, "despite the community's proximity to Delaware's boundary in Berlin Township, the developers said they do not plan to request annexation into the city in the future." - Beginning with the 550 acres in Orange Township, they are proposing a town center that draws its inspiration from Old Worthington, Uptown Westerville and the Short North rather than Easton. A development plan filed in Orange Township calls for about 950 homes north of the town center. The developers have not yet established the number of homes planned for the Berlin Township land. In the above linked article, the developers said the structures forming Orange Township's village center off Lewis Center Road at the southern edge of the site would likely will be the first buildings constructed. The Evans Farm project calls for 2,200 single-family homes on 1,250 acres in the Olentangy Local School District, in a “new urbanism” concept rooted in walkability, sustainability and mixed housing styles, plus restaurants, shops and other amenities. We'll see if it's West Clay or West Jefferson. With an initial 265 houses under construction east of Olentangy High School, Evans Farm Land Development Co. LLC is in full swing marketing about 150,000 square feet of accompanying retail space and 50,000 square feet for offices. Having steadily grown in scope in the past several years since it was announced, the project now is slated to include more than 3,100 housing units and 580,000 square feet of commercial development. “We’re in the final phase of making these things a reality,” Orange Township Trustee Ryan Rivers said at a gathering of county business leaders this morning. I was clicking around this area on Google Maps yesterday and I was pretty impressed with the amount of suburban neighborhoods that are currently under construction. I know downtown and the Short North get most of the attention in terms of residential construction, but the amount of homes being built in Delaware County is pretty significant. It won't be long until the land between the Scioto River and Alum Creek is one giant suburb between Delaware and 270. Really it stretches from Big Walnut Creek/Hoover Reservoir all the way to 33 between Marysville and Dublin. Check out the Jerome Village area. It's insane to drive around that whole area with thousands upon thousands of new homes, not one of which is cheaper than $500,000. The Dublin, Crosswoods, Polaris, Westerville, and New Albany corporate strengths have really been a boon to southern Delaware County residential growth. 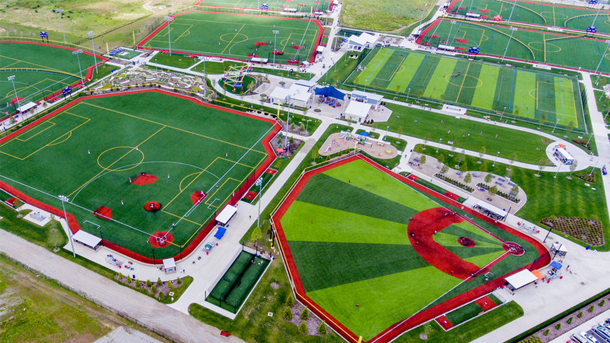 "A youth sports complex could be the latest addition to a titanic investment in Delaware County and an economic anchor in a fast-growing area. Officials revealed last week that developers behind the 1,200-acre Evans Farm development are in final negotiations for a new youth sports complex to complement 3,100 housing units and 580,000 square feet of commercial space in the $1.5 billion project, which would be built in Orange and Berlin townships with major work to begin next year. Termed “Project Grant Slam,” the nine-field complex would represent an investment of more than $20 million, with indoor and outdoor facilities for year-round baseball, softball, football, lacrosse, track, baseball and soccer events." "... all but 19 of Evans Farm’s first 142 units have been claimed by either builders or individuals. Those 142 units, still being built, represent the first portion of a neighborhood of 2,182 single-family homes planned to be constructed over the course of 10 years in the 1,250-acre development." I think I may have been a little hard on this on CU. While the number of single family homes is about 2200, the total number of housing units will apparently be around 3100 so I saw in another article. They don't mention the other housing units(apartments, etc). About 1600 housing units in a square mile is not that bad-for Delaware County. That could be up to 5,000 people per square mile. I do hope some of the apartments will be relatively affordable(as the homes will certainly not be)so at least some of the people who might work in the service areas they are planning for the place might have a chance to actually live there as well. I guess it is at least a step in the right direction and better than huge houses on acre lots.